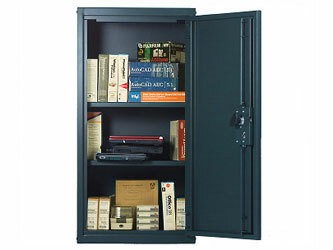 The Safe Plus Storage Unit is the ideal choice for for Schools or Offices. It is perfect for storing confidential paperwork, laptops, exam papers, computer equipment or anything of value. Made from high quality galvanised steel and coated with a tough polyester textured weatherproof coating, protecting against rust for a minimum of 10 years. Available in Dark Green, Dark Brown, Ivory, Ebony, Blue and Silver Grey. The Safe Plus has a single door, positioned on the front of the unit. Supplied with 2 shelves which are adjustable. It has the facility to enable it to be bolted to the ground which will prevent it being carried away, thus enhancing security.